Life can be filled with cruel surprises that crush our spirits under an unbearable weight that seems insurmountable to overcome. During those times, we need some sort of sign, a beacon of hope that things will get better, that things will be okay. 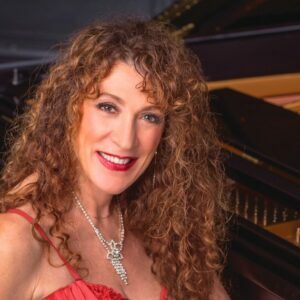 Unfortunately, as a society, we are starting to lack the ability, due to our circumstances, to see the light at the end of the tunnel and that is at the root of much of our political turmoil in the Western world. It seems that those raging against the establishment, on both sides, are overwhelmed with feelings of despair caused by not only the weight that things will not get better for current generations but the gloom that there is only a bleak future for generations to come. The Portrait of Joe Giusti’s Uncle. Ermenegildo Giusti (aka Joe) left his family’s farmhouse in Veneto, Italy when he was only 18 years old to seek out his fortune in Canada. 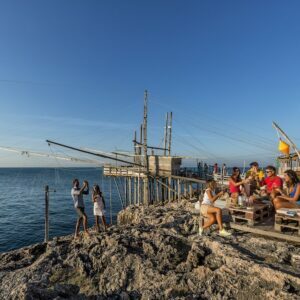 Through time, he would build a construction empire that would not only help him accomplish many personal dreams but would eventually lead him back to his homeland so that he could help his community in the Prosecco area of Veneto, Italy. Within a short amount of time, Joe has encouraged better practices among grape growers and started the process of rebuilding important symbols from the past. 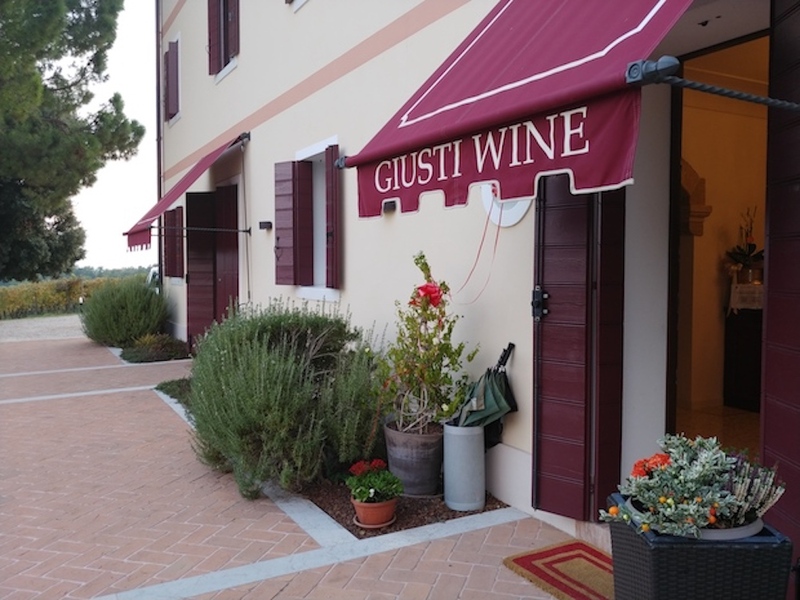 Giusti Wine (Giusti-Dal Col) was established by Joe Giusti in 2003 with only a small plot owned by his wife’s family; he has grown his vineyards to 264 acres (107 hectares) dividing the plots into “tenute” or named properties. We were there to focus on his Asolo Prosecco Superiore DOCG wines, as this designated area in Prosecco was only one of two top quality areas. 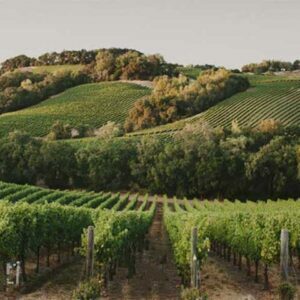 Joe has been very influential with other local wine growers in the area demanding more logical, sustainable practices. 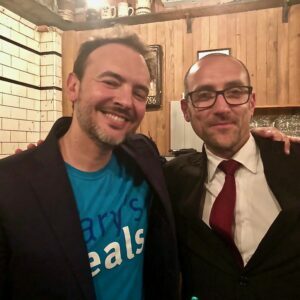 He has even turned down funding from the government in past difficult vintages as he was vocal in stating that the smaller producers needed more help than a producer with greater resources, such as himself. 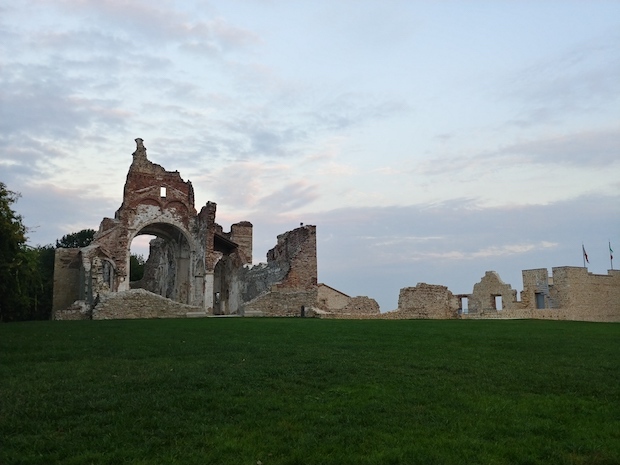 And if that wasn’t already enough, Joe made a significant donation, around one and a half million dollars, to rebuild the Abbey of Saint Eustace that was just up the road from his Abbazia (Abbey) estate in Nervesa della Battaglia. 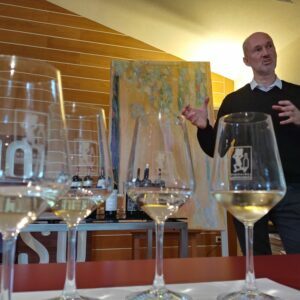 Tasting Wines at Giusti’s Abbazia (Abbey) estate in Nervesa della Battaglia. The Abbey of Saint Eustace (Abbazia di Sant’Eustachio) was built in the 12th century and it was destroyed in World War I with many of the previously stolen relics still being located around the world. It was almost like a dream visiting this abbey, which was only recently opened to the public last May, imagining what took place over several centuries – especially considering that the 100 year anniversary of the end of WWI was this year. The abbey had always been a symbol of hope for locals and visitors alike as many travelers from various cultures would pass through looking for a better life. It laid in ruins after WWI and WWII for decades, reminding the locals that their sacred structure was shattered – just like their dreams for future generations as their economy collapsed. Today, the area is coming back with growing work opportunities as they look out to the distance and see the Abbey of Saint Eustace being resurrected. 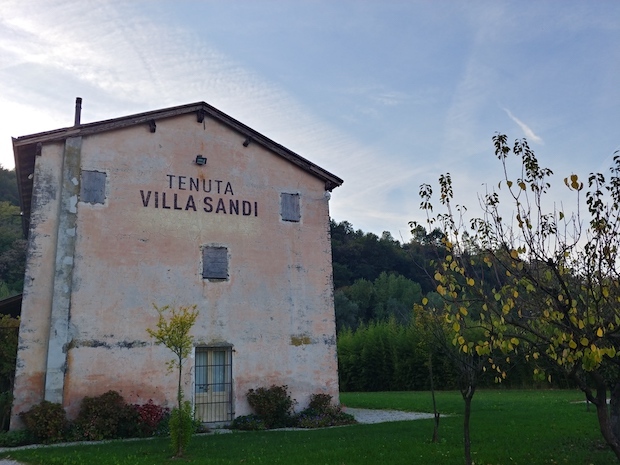 On another visit within the same area, Nervesa della Battaglia, we visited the Asolo estate of the well-known Prosecco producer Villa Sandi. It was like going back in time, just like with the abbey, as all I could see were vineyards, forests, and a building built before WWI as the smell of roasted chestnuts filled the air. This is where we were told about the Villa Sandi owner’s, Moretti Polegato and family, commitment to becoming a Biodiversity Friend. 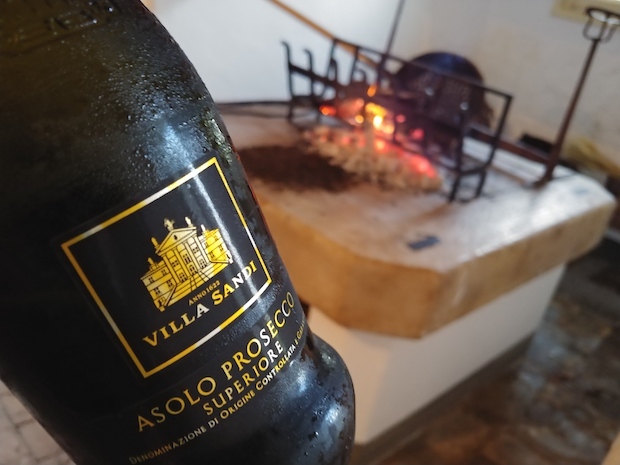 Drinking Villa Sandi Asolo Prosecco with Fire in Background. 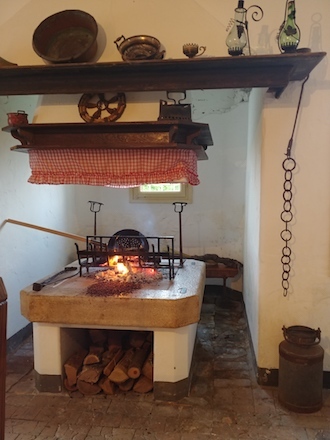 Fire to Roast Chestnuts at Villa Sandi Asolo Property. The World Biodiversity Association (WBA) was founded by experts in various disciplines of science, including many professors at the University of Verona, to stop the extinction of important species that were being killed off by pollution and deforestation. A multitude of plants and soil microorganisms help to manage and cure diseases, and there are still many undiscovered cures among the biodiversity of species that live in our world. The WBA has partnered with various farmers and vineyard owners, calling them Biodiversity Friends, to hire the WBA members to come out to rate their land in regards to their biodiversity friendliness and assist them by giving advice of raising those levels to a healthier place for biodiversity to exist in any given area. Pre-WWI Building on Villa Sandi Asolo DOCG Property. 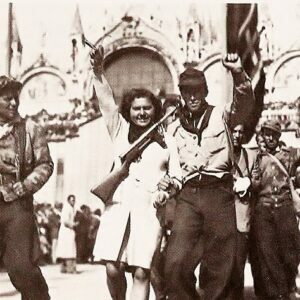 Again, the connection to WWI, which devastated the area of Asolo, was there as we sat in the century old stone building in the middle of Villa Sandi’s vineyards near a fire that had just been roasting the chestnuts we munched while sipping their Asolo Prosecco DOCG sparkling wine made from the grapes that surrounded us. If that building could talk, oh the stories it could tell! 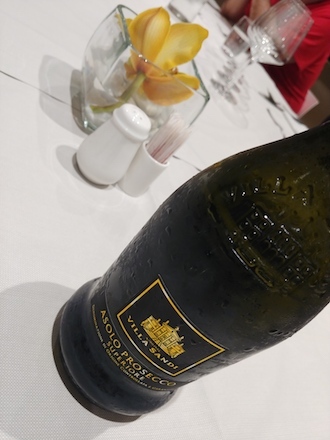 Villa Sandi Asolo Prosecco Superiore DOCG. 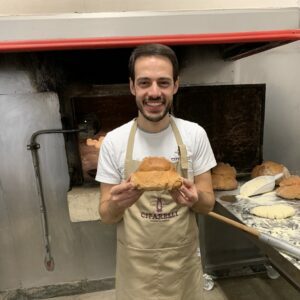 After decades, the people of Asolo were able to pull themselves out of an economic depression, which lasted until the 1980s, by building factories that would give their people a livable wage; currently they are considered to have one of the best economies in Italy. 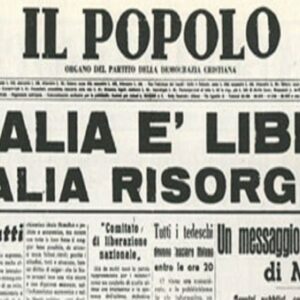 But in the process of creating financial betterment for the Asolo people, an inhospitable environment for much of their biodiversity was being forged. And so, that is why the Villa Sandi Moretti Polegato family has made a strong commitment to becoming a Biodiversity Friend. 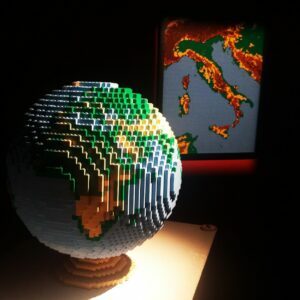 As we experience very shaky ground during intense political conflicts around the world happening among our own populations, these beacons become even more important as a reminder of what we have overcome in the past and what we need to focus on in the future. 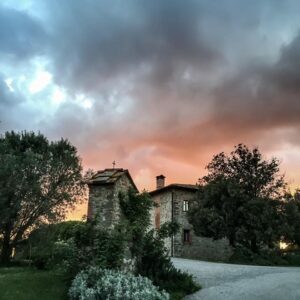 The rebuilding of the abbey is symbolic of the progress that Asolo has made from horrific times as well as the signs of sustainable practices helping them to reconnect to the harmony of Mother Nature. Villa Sandi Estate in Asolo Prosecco DOCG Photo Credit Villa Sandi. 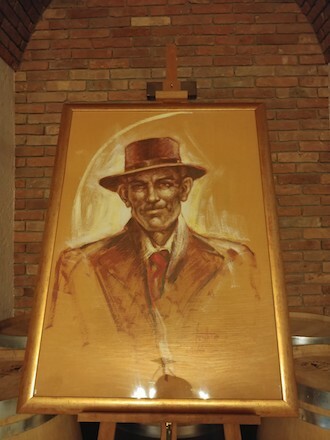 As I walked around Joe Giusti’s Abbazia (Abbey) estate, I saw a portrait of a man – Joe’s uncle – who encouraged him to travel abroad to find his fortune that would eventually lead him on the path to come back to help the community of his youth. The painting had a prominent place in the entryway of the Giusti cellar and it made me think that all of us need our worth acknowledged and encouraged. We need to know that we can take on the world to make it a better place and that there is no better beacon of hope than the one that helps us get up, get out, and ‘be the change’ we want to see in the world. NV Villa Sandi, ‘Il Fresco’, Prosecco DOC Treviso, Veneto, Italy ($13.99): 100% Glera. I’m sure many of us have tried this Prosecco DOC Treviso from Villa Sandi that not only has a key signature when it comes to packaging but it also has a distinctive style of Prosecco that makes it stand out from other producers. The gentle bubbles had a creaminess that was complementary to the zingy lemon custard fruit. 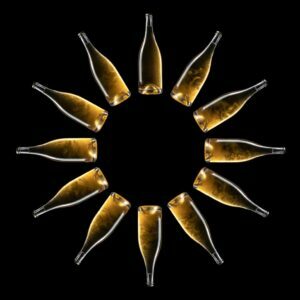 NV Villa Sandi, Asolo Prosecco Superiore DOCG Brut, Veneto, Italy ($20-25): 100% Glera. The Asolo Villa Sandi Prosecco hasn’t hit the US market yet so this is just an estimation of price. 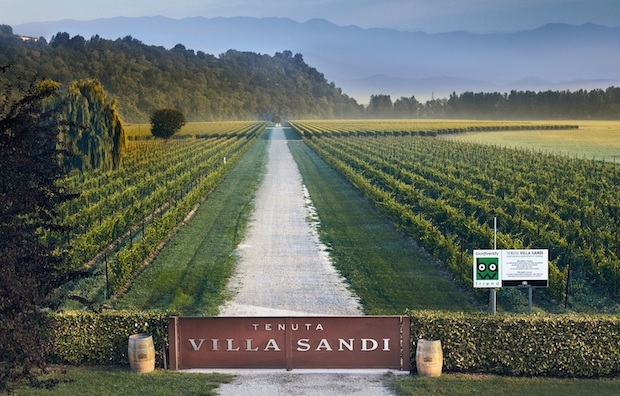 Villa Sandi’s lower pressure creates bubbles that lightly caress the palate with more peach fruit and sense of minerality that are markers for the Asolo DOCG area. 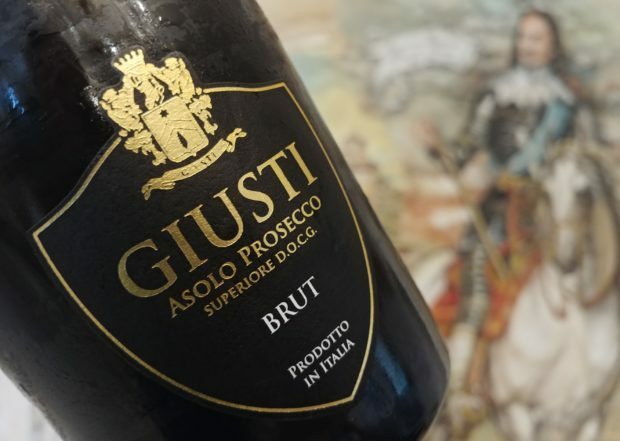 NV Giusti, Asolo Prosecco Superiore DOCG Brut, Veneto, Italy ($30): 100% Glera. Juicy nectarines, richly textured body with spice and hint of floral notes that had a stony minerality on the finish. 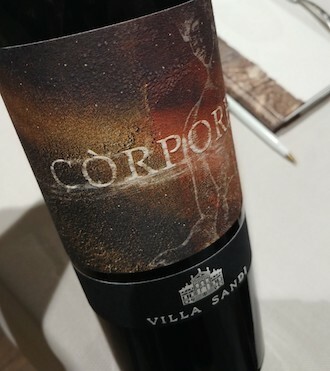 2013 Villa Sandi, ‘Còrpore’, Merlot, Montello-Colli Asolani DOC, Veneto, Italy ($30): 100% Merlot. The Montello area in Asolo is respected for their reds and their Merlot wines are expressive and elegant due to the cooler climate. 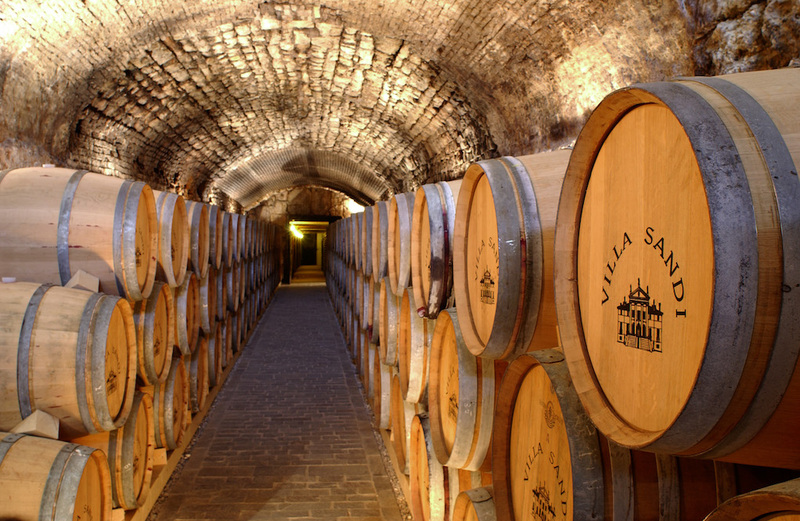 This Villa Sandi Còrpore comes from an estate vineyard that is mostly clay. The 2013 had the right amount of plush black and purple fruit on the mid-palate with soft tannins that had a hint of baking spice and crumbly earth along the sustained finish. 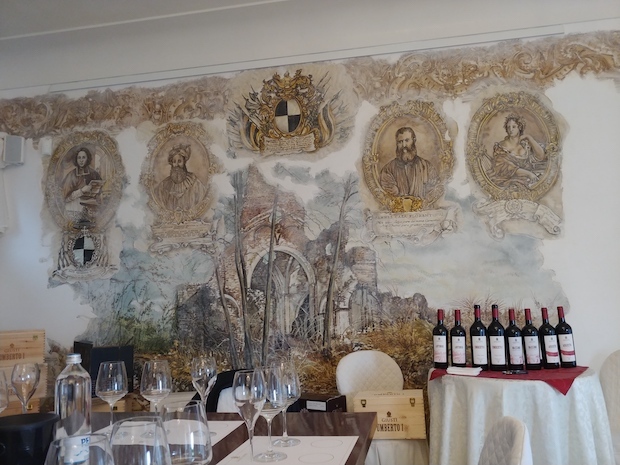 2011 Giusti, ‘Umberto I’, Rosso Veneto IGT. 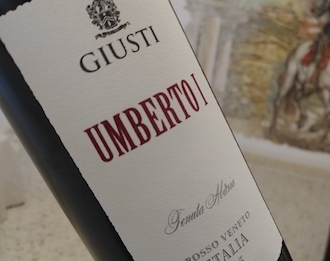 2011 Giusti, ‘Umberto I’, Rosso Veneto IGT, Veneto, Italy ($63): 60% Merlot, 35% Cabernet Sauvignon and 5% Petit Verdot with majority coming from the Abbazia vineyards near the abbey. This wine is named after Joe Giusti’s grandfather. This classic red blend had broad shoulders with round serious tannins that made it a big wine that had lots of finesse; enticing aromas such as forest floor, BBQ smoke, and delectable crème de cassis that had an outstanding long length.